HEINEKEN USA (headquartered in White Plains, NY) today announced that for the 15th year in a row, it is partnering with The City of White Plains and the White Plains Business Improvement District for its New Year. Safe Ride. program. Over the past decade and a half, the program has provided free and safe rides home to more than 5,000 Westchester County residents of legal drinking age who celebrate New Year’s Eve in downtown White Plains, NY. On New Year’s Eve, and year-round, HEINEKEN USA is committed to protecting the community and encouraging safe alcohol consumption. 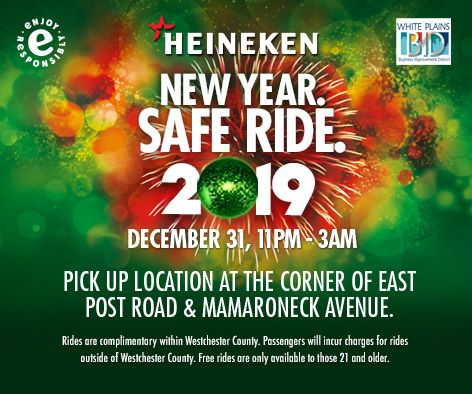 The safe rides transportation stand will be on the corner of East Post Road and Mamaroneck Avenue between 11:00PM on December 31st, 2018 and 3:00AM on January 1st, 2019. A dedicated fleet of cars, including at least one that is handicap accessible, will provide complimentary rides home for those 21 and older traveling from the heart of downtown White Plains to anywhere across Westchester County. Social pressures and behavioral norms interfere with responsible decision-making each day. A recent global study by Heineken®, found that 77% of respondents think there are circumstances where it is acceptable to drink and drive, while 49% get ‘caught up having fun’ and find it hard to plan ahead. Heineken® is encouraging everyone to plan ahead and utilize its convenient ‘New Year. Safe Ride.’ program so that they can enjoy the holiday season more safely and responsibly. The annual White Plains New Year’s Eve Spectacular is hosted by The White Plains Business Improvement District and the City of White Plains. The celebration will commence at 10:00PM on December 31st at Main Street and Court Street. Revelers will have the opportunity to ring in 2019 with a DJ and live music, ball drop, confetti and a dazzling firework display at midnight. Responsible consumption is key to the sustainable growth of Heineken’s® business and is part of the company’s Brewing a Better World platform, which is woven into ethos of the company. Since 2004, the ‘Enjoy Heineken Responsibly’ campaign has made responsible consumption and moderation aspirational to consumers globally. ‘Drink OR Drive’ is just one of many U.S. activations, which also includes the Health Alliance on Alcohol, a national public initiative to prevent underage drinking.